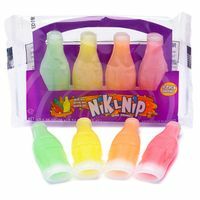 Nik l nips mini wax bottles filled with juice. Each wax bottle looks just like a pop bottle, these are a very popular candy from the 50�s. Bite off the top, drink the juice and chew the wax. 4 juice bottles per pack, 6 packs per package. If 6 packs of nik l nips are not enough and you need more we also carry Nik L Nips in a 24 count box in our 50's Candy Section.